Yeah we've talked about the Lafleur rebuttal before*, but nothing has changed. Everybody knows that you can't accelerate something that 1) isn't material 2) has no rest frame to begin with. The QV isn't hydrazine or other rocket propellant, this is the very nature of space and time itself; the PT part of CPT symmetry! It is the ground state of all known fields. It is pure field theory. This is a rocket scientist trying to accelerate mass out the back end trying to naively use virtual particles as the RM; hence why we need more eyes on this. Folks, please look at this model and tell me if your read of Paul March's description of the cavity joins are as shown, or is there a cone flange pinched under the Teflon gasket which is held in place by a thicker copper ring. 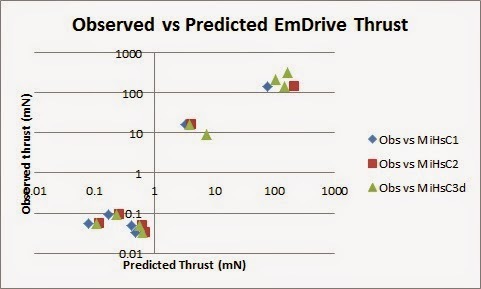 Dr. McCulloch has derived a new expression taking into account the three-dimensional nature of the truncated cone EM Drive and constructed a new comparison table. Bumbling off to bed, more convinced that the self-acceleration paper (Ido Kaminer, et al) has something going for it. Finally getting the feel of how it conserves momentum. With, luck I'll be snowed in w/ work caught up temporarily this weekend. 3) Why not get rid of the fiber-reinforced-polymer printed circuit board and just simply use a 1/4 inch thick (0.25 inches) copper plate for flat ends to prevent this thermal instability, and hence eliminate this artifact from consideration ? Answer: I used the FR4 PCB with 1.0oz copper end-plates to minimize payload mass while maximizing the thrust to weight ratio of the copper frustum assembly AND the signal to noise ratio of the torque pendulum system. I used the 1.0oz copper thickness because the ac skin depth of RF at 1.5 GHz is about 2.0 microns, so 5X that depth or 10 microns of copper should contain 99% of the ac currents at this frequency. And I still had an additional 25 microns of copper thickness as non-current carrying thermal mass to stabilize its performance. Now if you care to look at my pictures of the large OD end of the Eagleworks copper frustum, the mass of the entire frustum assembly without the PE discs is listed as 1.606 kg. Your 0.25" thick solid copper end plates would add over 3.0 kg of dead mass to this figure just for the small and large OD ends plates and cost us $333.50 for a 12"x 24"x0.25" copper plate stock from McMaster-Carr needed to make them. As I've said before we have tried aluminum angles and even 0.090" thick AL plates across the existing PCB end caps and noticed no change in its performance except for the increase in seismic noise pickup that the extra mass such payload-mass increasing modifications always bring to the table. A lurker here trying to keep an open mind. I agree that replacing the single-sided FR4 endplate with a .25" or .125" thick plate of copper is not practical because it would shift the CM too much and may require a complete rebuild of the apparatus. It is a good idea to perform experiments that prove or disprove alternative explanations for the observed effect. Playing devil's advocate is a good thing for science. I can think of a couple of ways to do this without upsetting the balance of this test setup very much. 1) Instead of applying RF power to the cavity use thin film heating elements to apply an equivalent amount of thermal energy to the inside of the cavity. There are several ways this can be done. To address Dr. Rodal's thermal mechanical movement hypothesis you could apply 10 - 20 Watts of heat to the center of the endplate, by gluing thin film heating elements to the copper. The kapton ones are very lightweight. In the Aug. paper a baseline test was described where the RF power was terminated in a dummy load. However the dummy load was not placed inside the cavity, if I remember correctly. Maybe you have since done this test. 2) Thermally isolate the inside copper of the large end plate by mounting a similar dimensioned piece of copper foil (.010" or less). The copper foil could be held in place with double sticky tape and small pieces of FR4 (pcb material). The copper foil would be heated by the RF instead of the thin copper on the inside of the endplate and a small gap between the endplate and the copper foil will insulate the thin copper of the endplate. A copper plate is unwieldy, heavy, and expensive, but what about an aluminum plate? Its bulk electrical characteristics shouldn't be too dissimilar from copper's in this application, right? Is there a need to find other complicated explanations before this one is proven wrong ? Well if I were an enterprising entrepreneur (which I'm not), I would definitely use the insight brought forth from the discussion and investigation in this thread and apply it toward exploring the possibility of building (additive or subtractive manufacturing) a device consisting of thousands of YBCO resonant cavities in a cluster and pumped with microwave and infrared radiation. Especially since it has been shown recently that YBCO will superconduct at room temperature when exposed to pulsed IR. Now go build me a hovercar! This is an op ed. Putting this all in perspective, the successful measurement of a thrust signature in hard vacuum helped me gain real confidence that the Emdrive and Cannae* are in fact producing a real thrust signature which begs explanation. For now it appears to work, but barely. Not enough to make people take notice, even though it works >6000x better than a photon rocket. This has potential to be HUGE. It would be irresponsible to not take this seriously now. Yes this is high risk, but it is also very high reward. I've been reading about crowdsourcing science lately after hearing a piece about it on the SGU podcast. Wouldn't it be nice if we could crowdsource research into the Emdrive. I'm thinking crowdsourcing because there is a taboo associated with this subject. Because it is assumed to go against established scientific concepts. Academic institutions and professionals would no doubt be hesitant to publicly acknowledge involvement in such research, without sufficient evidence this is real. Put another way, they won't touch it until someone before them assumes the risk first. BZ to Eagleworks for having the courage to at least take a look. This is the public attitude, but if you really examine the literature, Emdrive can be explained via established principles and only serves as experimental evidence supporting the quantum foundations of reality. As I've said, this isn't just some neat thruster, if it works it is also an instrument which could give immense insight into the nature of space and time itself. We really need contributions from experts in optics, materials science and QFT, with open minds. If we go the crowdsource route, we need a platform and we need leadership. Just like the hyperloop. This problem is to be figured out or put to rest. I have confidence that Eagleworks can eventually figure this out, but at the same time, we need to provide forceful backup**. The last thing we need is for this potential world changing technology to fall prey to an unworkable theory which leads to no results and time running out***. I know this sounds harsh, and I mean no disrespect. Do we want to be famous or correct? Both have to be true, to be true. In this writer's opinion, this is exactly what happened to ME. The inability or unwillingness to adapt one's theory in the face of new information and scrutiny. Can you imagine the space flight applications that could come from this potential technology, if it is in fact a reality and we can figure it out? Can you imagine what could have happened if we had not let it slip through the cracks for several more years? We (humanity) need to slough off our scientific hubris. We don't know everything yet; we only think we do. Quoting the controversial Rupert Sheldrake, "The science delusion is the belief that science already understands the nature of reality in principle, leaving only the details to be filled in. This is a very widespread belief in our society........." He is pointing out our hubris, how we think we know it all already, even as we are such a young, immature species. We don't know jack. Our collective ego surpasses our wisdom. The insight to be gained from our universe is as infinite as the universe itself, our comprehension is unfortunately finite. *We need to analyze Emdrive and Cannae equally; eg does thermal instability hold for both? Has anyone here considered a kickstarter campaign? Do we have a complete set of data like Mike's table, including mode numbers ? Kinda need expertise instead of money. A workable theory to help improve the performance is what is needed so as to be useful in space flight applications and other uses. Shawyer and Fetta own the invention. Also, if this EM Drive works due to some physical principle, it seems to me that the mode shapes may be very important concerning the amount of thrust for a given power input. Hence it is very important to understand what mode shapes are involved. 2) There is a substantial cut-off of mode shapes in the truncated cone. The solution shows that the TM01p mode shapes displayed by Greg Egan would be cut-off, yet Egan displays them as not being cut-off. 3) The frequencies for TE012 and TM212 are different than the NASA COMSOL calculations. 4) The solution does not display attenuation of the field strength from the big diameter to the small diameter end (instead modes are just cut-off completely). Therefore I decided to now compute the exact solution of the truncated cone using spherical wave transmission, as done by Greg Egan and others, to assess what is really going on in the truncated cone. Please note that the MEEP movie shown by @aero shows spherical wave transmission through the truncated cone. The exact solution using spherical wave transmission involves Legendre functions and spherical Bessel functions, and it involves the solution of two eigenvalue problems (one eigenvalue problem in terms of Legendre functions of the cosine of the cone half-angle "theta" and another eigenvalue problem in terms of spherical Bessel functions of the radial spherical coordinate "r" along which the curved surface of the cone is defined). Rather than give partial results and exhaust everybody's patience, I thought it best to take another week to establish really what is going on. Once I have performed calculations for the mode shapes at given frequencies using the exact solution, I will calculate a table for the different expressions. From what I understand (Rodal please correct me if wrong as I may have skimmed that too fast) the thermal buckling can very well explain the initial steep step thrust response to power-on. The steepness of the initial measured thrust on power-on were used as an argument by Eagleworks to rule out any thermal effect (as any thermal effect was supposed too slow to explain the sharp rise). Rodal's work shows that a thermal effect is not ruled out as far as initial steep rise is concerned : thermal buckling can account for the magnitude and rate of the initial rise (same ballpark). The question remaining is the sustained level of apparent thrust after the rise, sustained for 35 or 40 s at approx. constant magnitude. I'm not sure this was tackled and ruled out as possibly being produced by pure thermal buckling/dilatation explanation but my feeling (shared ?) is that it is hardly possible. A constant thrust of 50µN for 40s means a mass of 1kg (out of my hat, ballpark of heated mass) accelerating at constant a=F/m=50e-6 m/s² during the thrust plateau of 40s, that is an integrated displacement of (some mass of 1kg relative to rest of the frustum + balance arm) x=0.5 a t² = 4 cm (more than an inch). Also to have a (more or less) nice fall to flat baseline at power-off (as observed) would mean this moving mass would stop accelerating but continue at its gained velocity (relative to rest of frustum + balance arm) and ideally stop very gently, at opposite acceleration with magnitude much lower than the previous one. This continuation of movement would add even more to the total displacement, I'd say a few times 4cm (like 10 or 20 cm...). Otherwise if the moving mass where to stop quickly at power-off, we would observe a sharp fall of the thrust signature much below the initial 0 baseline. Generally you could tell such "thrust from displacement of one part of the drive relative to another part of drive (1)" by seeing a 0 net thrust when integrating during the power-on and well after the power-off : you would see a part above the baseline (power-on period) and a part below (after power-off) and the later would cancel the former. Either this : sharp stop of displacement at power-off, sharp thrust opposite to initial direction. It would certainly be possible to hide a moving mass inside the frustum, with a system to make it move the right displacement (many cm) to mimic a thrust signature with apparent net imbalance as seen from the outside (for not too long after power-off and with a "drifting baseline" to blur the opposite thrust period), but it's hard to see how such a huge displacement could happen by accident or stay unnoticed by experimenters. I would say that a thermo-mechanical effect involving a simple linear displacement of some driver's part mass is rather well ruled-out as an explanation for the sustained part (40 s) and early after decay of the signal. Maybe some more complex classical explanation might still apply. Therefore, we need to closely examine the Oak Ridge National Lab thermal expansion explanation as to its validity. I understood Paul March as asking for this thermal expansion calculation to be made and critically examined it to rule it out. There is a major problem with your explanations of the copper frustum's "thrust" traces being strictly due to the frustum's large OD end-cap's immediate inward oil-canning to the left, see attached thermal expansion diagram, which is then followed by the copper frustum's longer-term thermal expansion to the left of its 0.024" thick copper cone material. And this problem is that these thermal effect explanations for the generated torque pendulum (T.P.) movements are in the wrong direction to account for the observed thrust traces. I.e., they are fighting the observed thrust traces, not adding to or creating them. Now Newton's third law still states that for every action there is an equal and opposite reaction. So when the copper frustum's large OD end-cap's prompt and inward oil canning action, followed by the slower frustum cone thermal expansions, they both push the copper frustum's Center of Mass (CoM) to the left as viewed from the front of the Eagleworks' vacuum chamber looking back at the test article and torque pendulum, while noting how the copper frustum is bolted on to the T.P.. These thermally induced actions to the left requires the torque pendulum's arm to move to the right to maintain the balance of the torque pendulum's arm in the lab's 1.0 gee gravity field, since we also use the Earth's g-field to help null the pendulum's movements. However the observed up-going in the Y-axis thrust traces, see attached 50W slide, require the T.P. to move to the left, whereas the thermal expansion induced left-going CoM actions require the T.P. to move to the right. These thermal expansion actions should REDUCE and modify over time the magnitude of the observed thrust signal coming from the copper frustum's accelerations of the QV plasma to the right and out of the frustum. And you can see this negative longer term frustum thermal drift by noting the downward going baseline slope of the thrust trace even after the RF power is removed from the copper frustum. However the observed up-going in the Y-axis thrust traces, see attached 50W slide, require the T.P. to move to the left, whereas the thermal expansion induced left-going CoM actions require the T.P. to move to the right, which should REDUCE and modify over time the magnitude of the observed thrust signal coming from the copper frustum actions of accelerating QV plasma to the right and out of the frustum. And you can see this negative longer term frustum thermal drift by noting the downward going baseline slope of the thrust trace even after the RF power is removed from the copper frustum. An active subject of discussion (all the way back to thread one) was to know which way the truncated cone actually moved in the NASA Eagleworks experiment. I don't recall seeing anything in the Brady report concerning in which direction it moved: did it move towards the big diameter end ? or did it move towards the small diameter end? To add to the confusion as to which way the truncated cone moves, there is the difficult-to-follow reports from Shawyer as to which way his truncated cone moved in different experiments (actually Shaywer's definition of thrust force seems to be in the opposite direction as NASA's definition of thrust force). (See : http://www.emdrive.com/EmDriveForceMeasurement.pdf ). What about Cannae? It has completely different construction. Thrust was measured from it too. How does buckling explain Cannae? The Cannae "null" also worked which put the inventor's theory of operation to bed. Most importantly, the null gave support for the importance of the dielectric and thus a clue to the true mechanism for operation. When the dummy load (which efficiency converts all the rf to heat) was put in, the strong thrust signature disappeared. That also rules out spurious electromagnetic coupling by cables...etc. The fact that thrust vanished without the dielectric under low power testing by Nasa combined with knowing that Shawyer's testing with high power and no dielectric shows that the relative permittivity of the material in the cavity is important. Air is dielectric too. In my view, the thrust signal appears to be genuine and needs to be acknowledged. The results have held up under intense scrutiny. They have been replicated by others. After months of studying the test results and finding published scientific literature from experts supporting the notion that momentum can be gained from the QV.....This is real. Its easy to overlook items when there is a lot of new data to evaluate, but Thrust is to the left. See attached, top center of the image, second line. Its easy to overlook items when there is a lot of new data to evaluate, but Thrust is to the left. See attached. I think that the laws of physics should be the same for both Shawer's and NASA's experiments, hence it is important to answer the above questions (the way I carefully stated them). Where are the dimensions, and materials, of the Cannae device tested at NASA Eagleworks so that this question can be answered numerically ?